Behold, the return of our annual list of ultimate Christmas gift recommendations for the Halloween fanatic in your life, that person who lives and breathes the Halloween lifestyle every day of the year! Read on for our top picks of the hottest Halloween releases of 2018, all of which you still have just enough time to order and get under the tree. Halloween 4K Ultra HD Blu-ray – The one, the only, the classic …John Carpenter’s 1978 masterpiece re-released in celebration of this year’s landmark 40th anniversary of the Halloween franchise for the first time in glorious 4K Ultra HD. Buy it from Amazon here. Ultimate Michael Myers Halloween 2018 Figure by Neca – Based on his appearance in this year’s new Halloween movie (read our review here), this Ultimate Michael Myers figure stands over seven inches tall, with over 25 points of articulation and tons of killer accessories, including two heads, a knife, a hammer, a jack o’ lantern, interchangeable hands, Officer Francis’s decapitated head, and more. Buy it from Entertainment Earth here. 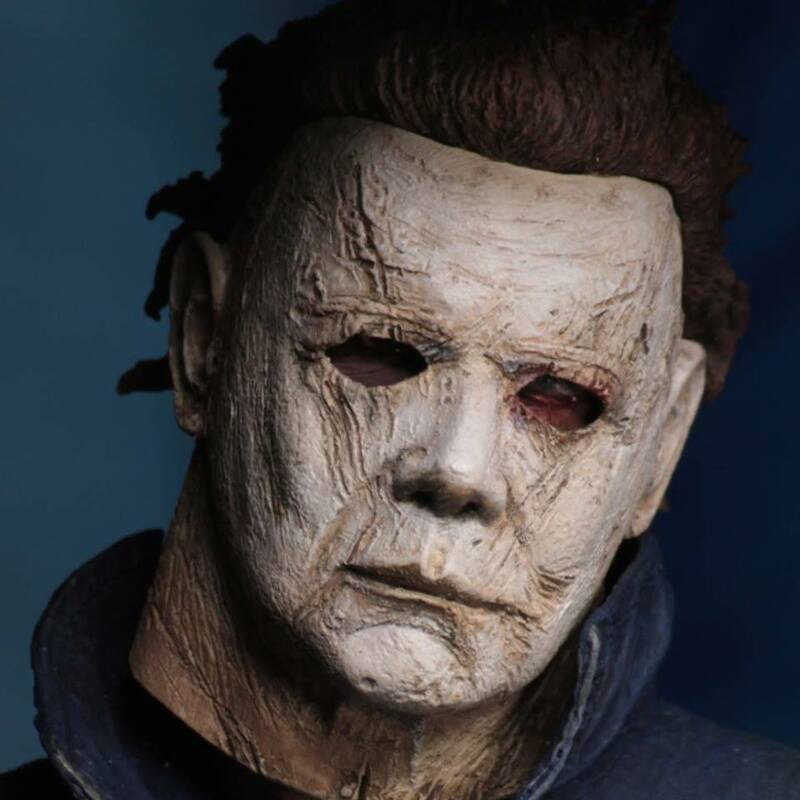 Halloween 2018 Official Soundtrack – Composed and performed by John Carpenter, Cody Carpenter, and Daniel Davies, the violently dread-filled soundtrack to the movie event of the year proves that the Master of Horror has not lost his touch one bit when it comes to crafting hauntingly memorable new themes and perfectly fitting updates to his classic work. Buy it from Amazon here. Halloween 2018 Official Novelization – A throwback to the days when movie releases (like the original Halloween, Halloween II, Halloween III, and Halloween 4) were regularly accompanied by an official novelization, this must-own book by author John Passarella has additional and at times differing material and scenes from the film. It is the best way to extend your stay in Haddonfield. Buy it from Amazon here. Michael Myers Greeter – He’s back… and smaller than ever! The infamous psychotic murderer from the Halloween franchise has returned, but this time he’s back with a different goal: to hold your candy dish. Standing at almost two feet tall and wielding his signature butcher knife, Michael is sure to send trick-or-treaters running… after they grab a piece of candy, of course. Buy it from Spirit Halloween here. Halloween H20 Michael Myers Door Greeter – What better way to greet your guests than with Michael Myers at your front door? This Halloween H20 prop features the face of your favorite horror icon with white LED lights in his eyes, which may just make a few people jump when they get to your door. It also plays the Halloween theme. Buy it from Spirit Halloween here. Halloween H20 Michael Myers String Lights – The officially licensed Halloween H20 Michael Myers string lights feature the iconic mask covering each of 10 lights. But it from Spirit Halloween here. Michael Myers 6ft. Animatronic – Standing at over six feet tall, this new Michael Myers animatronic is authentically designed to resemble The Shape and scare everyone that comes in contact, with side to side body movements and an arm that slashes up and down while holding his butcher knife. And of course it also plays John Carpenter’s iconic Halloween theme song as it moves. Buy it from Spirit Halloween here. Michael Myers One:12 Collective Figure by Mezco – With over 30 points of articulation and standing six inches tall, this highly detailed figure features a film-accurate sculpt and coveralls, as well as an alternate head with affixed ghost sheet and glasses to recreate the infamous “See anything you like?” scene in the film. The figure also comes equipped with both bloody and clean knives, a light-up jack o’ lantern, the Judith Myers tombstone, and a base with the film’s 1978 poster art. Buy it from Amazon here. Michael Myers Living Dead Doll by Mezco – Living Dead Dolls presents Michael Myers, standing approximately 10 inches tall with five points of articulation, featuring rooted hair and film-accurate blue coveralls, and equipped with his signature knife accessory, as Michael’s dark eyes pierce through the all-new face sculpt of his iconic and expressionless white mask. He comes packaged in a die-cut display-friendly window box. Buy it from Amazon here. Halloween: Resurrection Michael Myers Savage World Figure by Funko – The Bogeyman joins the new Savage World line, which features figures in the bulked up, muscular barbarian style of the 1980s He-Man and the Masters of the Universe 5.5-inch action figures. Buy it from Amazon here. The Nightmare Before Christmas Silver Anniversary Pumpkin King Jack Skellington Action Figure – Diamond Select Toys is celebrating the 25th anniversary of The Nightmare Before Christmas with a line of cloth-costumed, fully poseable 10-inch action figures. Jack in his Pumpkin King costume features a real fabric outfit, multiple points of articulation, and character-specific accessories that include a Halloween Town sign and torch, all packaged in a coffin-shaped window box. Buy it from Entertainment Earth here. The Nightmare Before Christmas Silver Anniversary Sally Action Figure – Diamond Select Toys is celebrating the 25th anniversary of The Nightmare Before Christmas with a line of cloth-costumed, fully poseable 10-inch action figures. Sally comes with her oven and cauldron, packaged in a coffin-shaped window box. Buy it from Entertainment Earth here. Hocus Pocus Pop! Vinyl Figures by Funko – Buy the three-pack of figures from Spirit Halloween here. Hocus Pocus Key Ring Mini Figure Blind Pack by Funko – Buy one from Spirit Halloween here. Hocus Pocus 18-Inch Plush Dolls – If you don’t have enough of the Sandersons in your life, you can now snuggle up with your favorite sister with these officially licensed plush dolls. Buy Winifred Sanderson from Spirit Halloween here, buy Mary Sanderson here, or buy Sarah Sanderson here. The Nightmare Before Christmas 8ft. Jack Skellington Santa Inflatable – The Pumpkin King of Halloween Town does his best Santa Claus imitation in this officially licensed larger than life inflatable from the classic film. Buy it from Spirit Halloween here. The Nightmare Before Christmas 5.8ft Sally Animatronic – This officially licensed life-size Sally animatronic prop is motion and sound activated, as she not only moves and talks, but also sings one of the classic songs from the classic Tim Burton-produced movie. Buy it from Spirit Halloween here. John Carpenter’s Tales for a HalloweeNight Vol. 4 – The latest graphic novel collection of Halloween-themed horror stories by some of the most talented writers and artists in the business, this fourth volume of Tales includes new stories written by both Carpenter himself and his wife/producer/publisher Sandy King, among others. Buy it from Amazon here. Hocus Pocus and the All-New Sequel – This release includes both the official novelization of the original 1993 Disney movie and its new sequel that takes place 25 years after the events of the film, as Max and Allison’s seventeen-year-old daughter, Poppy Dennison, finds herself face-to-face with the Sanderson sisters in all their sinister glory. When Halloween celebrations don’t quite go as planned, it’s a race against time as Poppy and her friends fight to save her family and all of Salem from the witches’ latest vile scheme. Buy it from Amazon here. Avengers Halloween Special #1 – Earth’s mightiest superheroes are featured in an anthology of spooky stories, as Iron Man and Captain America take on a journey for one of Howard Stark’s abandoned weapons, but what they find is different than any kind of horror that they’ve ever encountered. Bonus stories include Daredevil, Punisher, and the X-Men, as this collection brings together an epic team writers and artists to take your favorite characters on all-new frightful adventures, including Jen and Sylvia Soska (American Mary, See No Evil 2, Rabid) and actor/writer Jay Baruchel (Goon, This is the End) making their Marvel Comics debut. John Carpenter Live Retrospective 2016 Tour Blu-ray – Now you can experience John Carpenter’s epic 2016 Retrospective concert tour in the comfort of your own home on Blu-ray, featuring live performances of all your favorite tracks from his most iconic soundtracks as well as newer material from his Lost Themes album. Buy it from Storm King Productions here. Hocus Pocus 25th Anniversary Blu-ray – Disney’s witchiest family favorite was re-released this year in honor of its 25th anniversary in a new Blu-ray + Digital combo pack that also includes a 40-page gallery book. Buy it from Amazon here. The Nightmare Before Christmas 25th Anniversary Blu-ray – The ultimate marriage of Halloween and Christmas was re-released this year in a new Limited Sing-Along Edition Blu-ray + Digital combo pack that also includes a 40-page gallery book. Buy it from Amazon here. Night of the Demons 30th Anniversary Steelbook Blu-ray – The 1988 Halloween party from Hell got the limited edition Steelbook treatment with a newly 4K-scanned Blu-ray release in honor of three decades of Demons. Buy it from Amazon here. Terrifier Blu-ray – Art the Clown returns for another Halloween night of mayhem in writer/director Damien Leone’s brutal and gory (read our review here) spin-off of his 2013 anthology All Hallow’s Eve. Buy the Blu-ray + DVD 2-Disc Pack from Epic Pictures here. Trick ‘r Treat Collector’s Edition Blu-ray – The modern classic Halloween anthology got the Collector’s Edition treatment from Scream Factory this year, including a new feature commentary by writer/director Michael Dougherty and newly-commissioned director-approved artwork by Devon Whitehead. Buy it from Amazon here. Halloween 2007 Steelbook Blu-ray – Writer/director Rob Zombie’s remake was re-released with a new, limited edition steelbook cover this year, and the controversial film absolutely deserves a rewatch now more than ever, in the wake of David Gordon Green’s 2018 entry of the same name. Buy it from Amazon here. Halloween 2018 4K Blu-ray – Michael Myers came home again in the horror event of 2018, and now the new Halloween movie coming home in a 4K Ultra HD + Blu-ray + Digital combo pack that features more than 30 minutes of bonus content, including seven deleted and extended scenes. Pre-order the 4K Blu-ray from Amazon here (to be released Jan. 15), or on Digital HD here (to be released Dec. 28). Hell Fest Blu-ray – A masked killer stalks the ultimate horror-themed scream park on Halloween night (read our review here) in this highly entertaining haunt thrill ride, coming home in Blu-ray + DVD + Digital combo pack. Pre-order it from Amazon here (to be released Jan. 8). Goosebumps 2 Blu-ray – They may have dropped the Haunted Halloween subtitle, but this family friendly sequel is perfect for younger audiences who can’t get enough of the holiday. Buy it on Blu-ray from Amazon here (to be released Jan. 15), or buy it on Digital through Amazon Prime here (to be released on Dec. 25). So what’s on your Halloween Christmas wish list this year?